ORLANDO, Fla. — The die was cast for the 2012 ICAST show about four years ago when Andy Poss turned on the television in a motel room after a long day of work as a union welder. He was in the state of Washington; he doesn't recall exactly where. "I watch Animal Planet at lot," Poss said. During this particular program, an underwater camera showed a school of tuna feeding on a big school of sardines. "Eight or 10 sardines would bust out of that school," Poss said, "and it seemed like every one of those tuna went to them. That got me to thinking: I've seen that on my lake – the Tennessee River. If a bass can ever get some baitfish to break out of a school, every bass in there will go after them because they are easier targets." So Poss thought about what he could create that would mimic a small group of baitfish. It was another 18 months before Poss had his first prototype of what would become known as the Alabama Rig – a five-wire harness to which jigs or small swimbaits can be attached. Poss wasn't at the annual fishing trade show a year ago. He had just started Slick Lures LLC and begun manufacturing what would become the latest sensation in the fishing world. It was on Oct. 23, 2011, when pro angler Paul Elias smoked the rest of the field to win $100,000 in an FLW tournament at Alabama's Lake Gunterville. His four-day total was 102 pounds, 8 ounces, which was just over 17 pounds better than second place. That's when news of the Alabama Rig spread like a wildfire, and Poss's life changed forever. When you take a stroll around the new products section at this year's ICAST show, evidence of the Alabama Rig influence is everywhere. 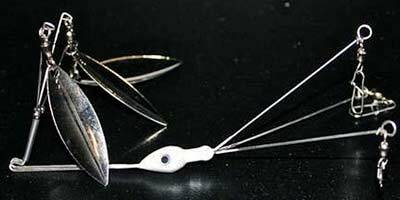 It seems that every type of lure now has an "umbrella" model, like the Scuttle Buzz made by Livingston Lures – a hybrid spinnerbait/buzzbait that has three hooks and multiple metal blades flashing in every direction. Even lures for crappie have copied the concept, as in Blakemore's Slab Daddy Supper – a two-jig rig that offers, "Two servings on every cast." The fishing industry is well-known for knocking-off the traits of any successful lure. The Alabama Rig is just the latest example. Poss, who lives in Muscle Shoals, Ala., soon realized his invention had out-grown the mom-and-pop operation he was running with the help of his wife, Tammy. So he signed an agreement with Mann's Bait Company in Eufaula, Ala., to be the exclusive licensee for the manufacture, marketing and sales of Alabama Rigs. Andy and Tammy Poss were in the Mann's booth at ICAST on Wednesday. "It's been a good thing," Andy said. "Everwhere I go people tell me about catching fish on the rig. I have had a lot of fun with it. And that was the goal to begin with." 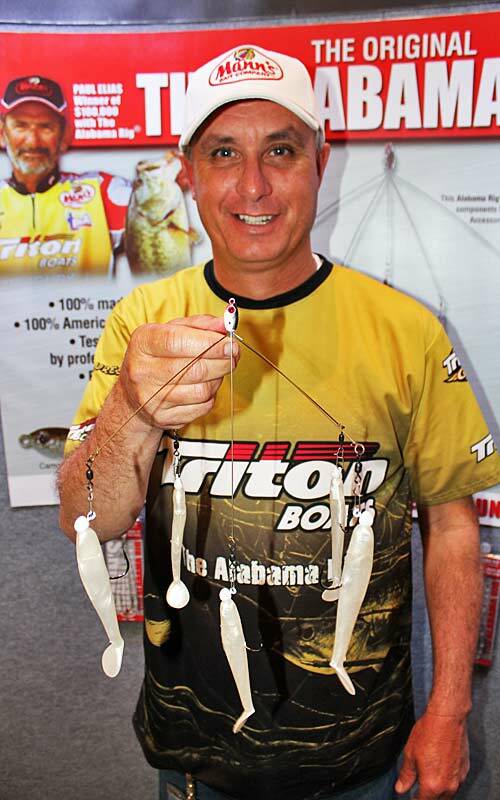 Poss has a patent pending on the Alabama Rig. It appears it would take a convention of lawyers to defend that patent, if he gets it, which Poss expects to do later this year. Poss hasn't sold his welding equipment, but he hasn't spent a day at his old job since Elias' victory last October. "We've been busy," Poss said. "It's been beneficial to our whole family." One night spent relaxing in front of a television has dramatically changed Andy Poss's world.